This is amazing. Not only is it old but the “technology” used to build this temple was beyond time – even though it is nothing in today’s building technology. 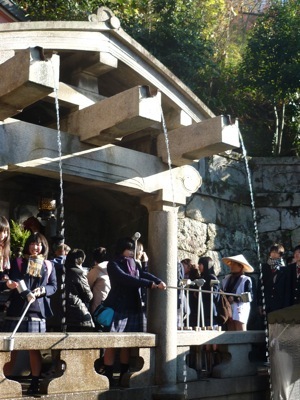 Kiyomizu, which means pure water, founded in 798. Kiyomizu (清水寺) is a wooden temple with its main hall built over a valley supported by 139 pillars (15m high) at the bottom. If that is not impressive enough, with no nails. 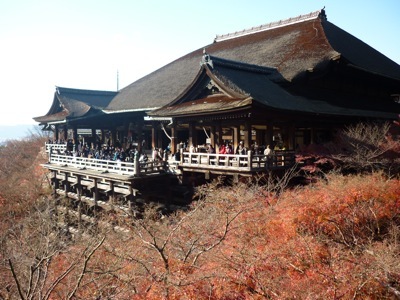 Granted Kiyomizu is one of the many sites in Japan listed under Unesco World Heritage. Besides the main building, the compound is huge and it consists of a few sections. One is for believers to find love of their life. There are 2 stones about 30 feet apart. If you can walk with eyes closed from the first stone and walk all the away to find the second one, you will find your life partner pretty soon. 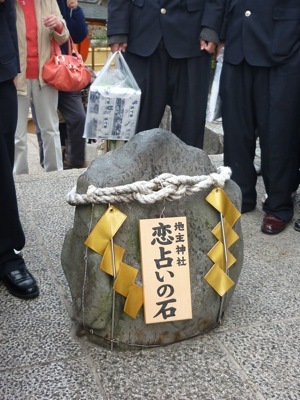 If you get to the second stone with the help of a friend, it indicates that you need a “middleman” to find your love. Another section is for women who want babies. By touching the bronze statue of Buddha, it is believed that women can get pregnant. The final part is Otowa falls. The falls are divided into 3 streams – which indicates longevity, success in school, and love respectively. If you want longevity, you drink from that stream. I didn’t have the chance to drink as it was packed with students that day. A good tip from our tour guide. If you need all three, you can collect from all the three fountains first before you drink. It was here that we met four young Japanese girls in kimono. We took the opportunity to have pictures taken with them. They gladly accepted our request. One of them was able to speak English – a real bonus in Japan. 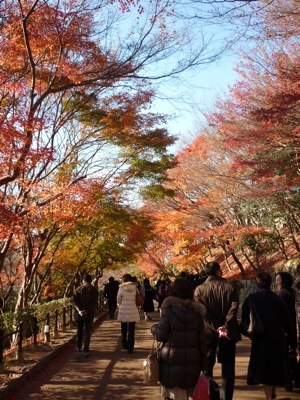 TIP: On both sides of the street leading to Kiyomizu, there are many stores selling souvenirs, porcelain, foodstuff, clothing, etc. Once thing we found out about Japan is souvenirs bear about the same prices no matter where you are in Japan. The differences, if any, are negligible. But what they are selling is almost the same things, except that they bear the name of the location you are in. To reach Hamamatsu from Kyoto, it is a long drive. It took us about 4 hours to reach the hotel. Before that we stopped at one of the R&Rs for dinner. This time it was self paid as it was not part of the tour package. I had unagi dinner set (with rice and soup) for ¥1,380. My wife had fried pork set at ¥1,000. The weather outside was very cold. There is a convenience store called FamilyMart not far from the hotel. After checking in, we went there to stock up some snacks and I got myself a winter hat (¥1,029) as I couldn’t stand the cold and needed to cover my ears.